Let’s face it. No game day table is complete with something “buffalo chicken”. Am I right? Whether it’s wings, dips, sandwiches, or lasagnas (yes, that actually exists), there’s just something about buffalo chicken that makes it a party staple. And it’s the one thing that I just cannot resist! For this year’s Super Bowl, I’ve got no big party to attend, so it’ll be just me, the hubs, and the kids. This is good though because I’ll be making all the game time goodies, so I can make sure I’ve got only healthy, weight watchers friendly snacks on the table. To satisfy my need for all things buffalo chicken, I’ll be whipping up these incredible Buffalo Chicken Celery Sticks. You guys, I kid you not, these things are ridiculously delicious and a breeze to make. It literally takes just a few of ingredients, and 10 minutes, and you’ve got one seriously stellar appetizer recipe that is so good, you may not want to share. And that’s OK. No judgment. I am a HUGE fan of Frank’s Red Hot Sauce. In fact, I’ve loved it ever since I was about 8 years old and my dad taught me to eat it on top of hard-boiled eggs. It is seriously the best hot sauce, and nothing else will ever replace it for me. And no, they aren’t paying me to say that. It’s just the perfect balance of spicy and tangy, and it’s very clean – no crappy additives. So being able to find a way to incorporate it into another one of my Super Bowl recipes makes me super happy. And the fact that this particular buffalo chicken recipe is very low calorie, and just 2 Points is a fabulous bonus. If you are regularly craving hot wings, you are going to want to give these babies a try, ASAP. Typically, when I eat celery, I need something super delish to dip it in and scoop it up with, like peanut butter, or spinach artichoke dip. I can eat it plain, but I prefer to jazz it up. That’s why this recipe works so well…it makes celery bearable for the folks who can only eat it with a dip. These Buffalo Chicken Sticks take celery to a whole new level. Now even though I’m suggesting these as a party food, there’s no reason why you can’t make them for a light lunch or low-fat snack, anytime! And if you don’t happen to have any celery on hand (or if you really despise it), the filling works great in lettuce cups or on top of salad too. Because you will need cooked chicken with this recipe, I suggest buying a cooked rotisserie chicken from the store if you want to keep it super easy, or just roast a few chicken breasts whenever you have some extra time and pop them in the fridge or freezer. Honestly, it’s a good idea to make roasted chicken breasts in bulk anyway, because cooked chicken is used in lots of recipes, and it’s nice to have some already on hand. So, before you hit up the grocery store to stock up on your game day grub for this Sunday, make sure to add this recipe to your shopping list. It’s the perfect, guilt-free buffalo chicken appetizer that you will want to be serving up at every get-together! PRO TIP: If you are making these for a party, and want to prevent them from rolling around on the plate, simply slice off the rounded edge of the bottom of the celery stick. This will help them lay flat, and help your plate stay pretty. Want some other tasty buffalo chicken recipes to try? Then make sure to checkout my Buffalo Chicken Taquitos and my Buffalo Chicken Meatballs ….sooooooo good! 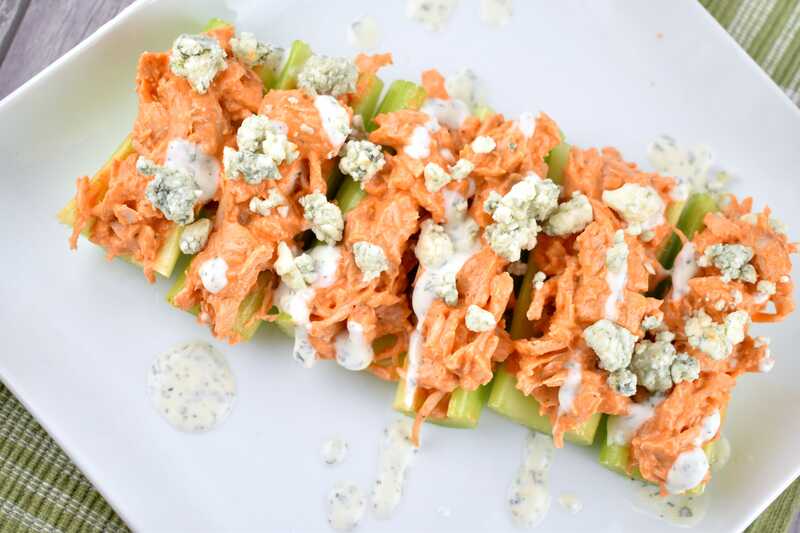 Up your game with creamy, spicy buffalo chicken atop cold, crunchy celery sticks. A calorie-savvy buffalo chicken creation, these easy, no cook appetizers are the perfect game day treat. In a small bowl, whisk together the hot sauce, garlic powder, and cream cheese. When well blended, pour over the shredded chicken, and mix. Stuff each celery stick with the chicken mixture. Plate the celery sticks, drizzle with the ranch and top with the crumbled blue cheese.